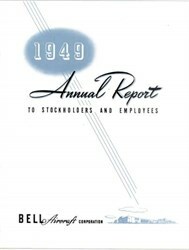 Bell Aircraft Corporation Annual Report issued in 1949. This historic document has the image of a company building on the cover and is over 55 years old. This 20 page report includes lots of pictures, graphs, charts and financial information. Bell Aircraft Corporation, founded by Larry Bell, is famous as the manufacturer of the P-59 (America's first jet airplane) and the X-1 (the world's first super- sonic plane). After years of development, the Bell 47B, a descendant of the original model 30 helicopter invented by Arthur Young, became the first commercially licensed helicopter in the world. By 1951, Bell helicopters were in service around the world, in both commercial and military roles. In 1960 Bell Helicopter Corporation was purchases by Textron, of which it is still a major subsidiary. Bell Helicopters now fly in more than 100 countries around the world and a Bell Model 47 hangs in the entrance to the Architecture and Design wing of New York's Museum of Modern Art. At that time Bell was already a manufacturer of conventional aircraft such as the WWII fighter P-39 Airacobra and the P-59, America's first jet-powered airplane. In addition, Bell was to develop the X-1, which was to become the world's first super- sonic plane. By 1951, Bell helicopters were in service around the world, breaking records as fast as they were setting them. And since Bell Aircraft Corporation's reputation for helicopter manufacture began to rival its reputation as a builder of conventional aircraft , the company created a separate helicopter division which was headquartered in Fort Worth, Texas. Today, with Bell helicopters flying in more than 120 different countries , they are logging another ten hours every minute of every day. Bell Aircraft Corporation, the predecessor of Bell Helicopter Textron was founded July 10, 1935 in Buffalo, New York by Lawrence D. Bell, a man referred to as "America's most seasoned dreamer." Bell Aircraft Corporation created a Helicopter Division which moved to Fort Worth, Texas in 1951 and became Bell Helicopter Corporation, a wholly owned subsidiary of Bell Aircraft Corporation. In 1960, Textron of Providence, Rhode Island bought various Bell Aircraft properties including the Helicopter operation. Textron changed the name of the helicopter operation to Bell Helicopter Company, and within a few years established itself as Textron's largest division. In January 1976 the name was changed to what it is today, "Bell Helicopter Textron". Lawrence Bell (1894-1956) left high school at the age of sixteen to follow his brother into the airplane industry. Two years later, he became shop foreman in the mechanical division of the Glenn L. Martin Company, making him familiar with every aspect of the manufacture of airplanes, especially their engines. He quickly ascended the ranks at Martin, becoming vice president and general manager by 1925, but he resigned soon after to join the Consolidated Aircraft Corporation team. He remained with Consolidated for seven years, but when the company moved to California in 1935, he stayed behind, instead forming the Bell Aircraft Corporation with two of his Consolidated associates. Over the next decade-and-a-half, Bell received numerous contracts for various types of planes, but the achievement for which his firm is best known, was the design of the Bell X-1, the vehicle that broke the sound barrier on October 14, 1947. See "Lawrence Bell," biographical file, NASA Historical Reference Collection.